After the last attempt with ZL1XTC and myself getting only one contact there was heaps of room for improvement, speaking with Brett ZL2VZ and Jonny ZL2JBK it was decided that we would give the April Low Band Contest ago from Stratford Plateau. Over the next month I browsed the net looking at a number of different designs for 6m and 2m yagis that would be easy to put together erect and pull down and something that wouldn’t take hours of fine tuning every time it was setup, I finally found a design for a 2m antenna that used wooden clothes pegs to hold the elements into place, didn’t really find a good design I could follow for a 6m yagi and as I had never built any size yagi antenna and been advised the designs should be followed exactly or the antenna might not work as intended. 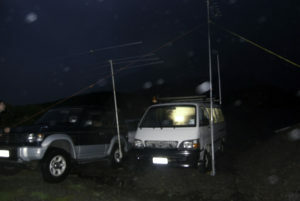 I jumped right in and used part of the design I had from the 6m yagi and based it on the 2m yagi portable style. After buying the lengths of aluminium I set about trying to find some wooden pegs: who would have thought this was so hard, all the normal stores I thought of looked at me strangely when asking for wooden pegs, seems to be the plastic ones have taken over. Well back to the drawing board and with some help a basic solution of a small block of wood with a hole drilled in it and a split out one side of the hole to the end of the block that could be squashed using a bolt to hold the element in place was made and having a second hole drilled in the other end of the block to keep the element aligned. After a few hours of construction the antenna was built and it was time for testing. On the bench and still connected to the analyser the SWR was way too high. Checking over the antenna I found one of the elements centred incorrectly on the boom, correcting this brought the SWR down to around 5:1 well not quite what I wanted but this was only testing on the work bench, the next day when there was daylight the real test up on a mast plate mounted under the wheel with the antenna hanging above the vehicle the SWR dropped to 1.2:1. Out with the radio a couple of short tests were done to a local ham and then it was out to Ian’s’ ZL2IH for him to check it out on his analyser. Well this showed that there was still a little bit of work to be done as it was off phase and unbalanced! Well after a few adjustments and some education on yagi construction the 6m yagi was in phase balance and the SWR was down to 1.05:1 right on the part of the band we needed for the Contest. With Jonny Bringing the 2m and 70cm antennas and radios, my radio and 6m antenna, Brett providing battery power and permission granted for use of the club callsign ZL2AB, we were all set. Well at least that’s what I thought! Over the next week the gear list doubled additional batteries were added , a couple of amplifiers for 2m and 70cm, a second radio for 2m with a last minute build halo antenna by Jonny, a generator, floodlights and a VAN! The day arrived and the weather had given its normal Taranaki turn out, rain and wind, that van was going to be the saviour of the event and provided some much need shelter. We had arranged to meet at location at 4pm to give us a hour to setup, on the way I picked up yet another battery (we were planning to power the gear for a week by the amount of power we had) therefore making me a little late. Brett and Jonny had arrived and were starting to setup the 2m and 70cm gear as by design the 6m antenna didn’t take too long to setup and we were on the air by 5:30pm (I really should have got there at 4 sorry guys) we put out our first call starting with 2m FM and made contact with Steve ZL2KG and then a check on 70cm FM with Steve as well. Over the next couple of hours we made the normal contacts and Brett had to disappear home. 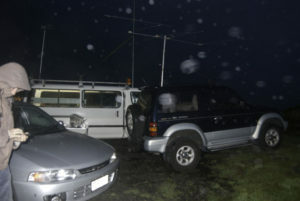 We were having great success on 2m with some contacts on 6m as well but 70cm we were not having much luck got the odd contact but mostly getting reports that people could hear us, we just could not hear them ,not giving this much though we continued keeping busy with 2m and ended up slightly burning tea. As the night progressed with the weather still giving us lots of rain and wind the 6m antenna was left pointed in one direction with a couple of quick changes when the rain played nice. 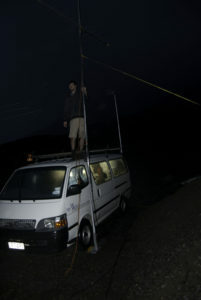 The 2m/70cm antennas mast was just outside the window and if the wind was blown the right direction we could adjust by hanging out the window without getting too wet. We kept trying 70cm every time someone asked if we had it to finally about 9pm we worked out the amp was not switching correctly between tx and rx, it was locked on tx. With this information we finally made a few contacts manually switching between tx and rx each over. 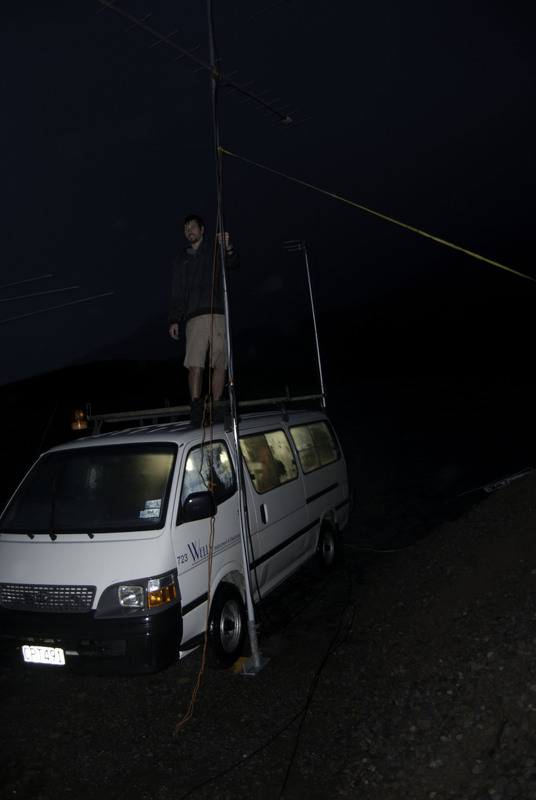 We are all really happy with the contacts we made over the course of the night with the furthest getting down to Christchurch on 2m. 1st gear wise make sure the amp is switching correctly, we most likely would have got a heap more contacts on 70cm if we had known this earlier in the night and would have put more effort into that band. 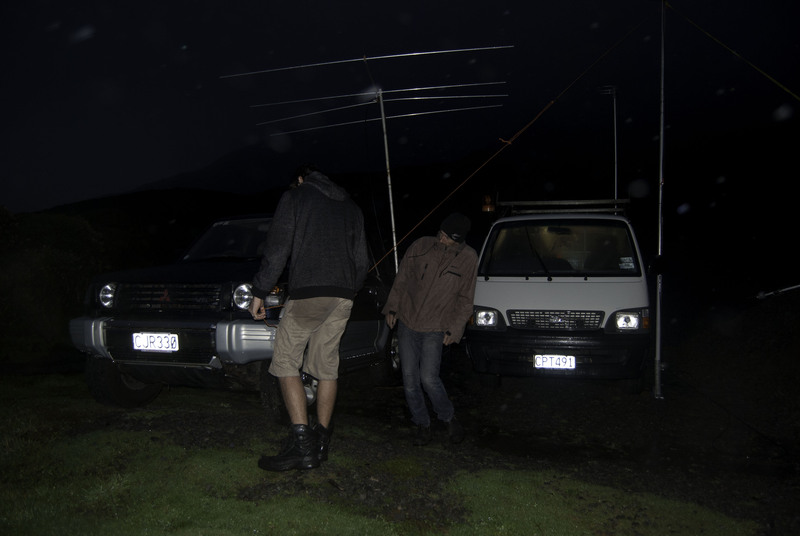 2nd we really need to sort out some sort of rotator as Taranaki weather never likes to play nice and we are going to get wet and on a mountain being soaking wet and cold is never good if we have to leave the vehicle all the time to change antenna direction. 3rd Make sure we record the direction the antenna is pointing while we did enjoy putting out random calls all and then turning the antenna slightly we could have got some better signals for some people that came back to us if we had a recorded direction for them from the last QSO. 4th Take a printed copy of the CURRENT rules, unfortunately during our QSO we were informed of an old rule that if we left site our points would be reset to zero if we returned the next day. Therefore as we were not fully prepared to spend the night on the mountain we headed home and did not return. Having been given this information we did not even speak about returning. We may still have not come back the next day but at least it would have been by our choice not by incorrect information from an old rule. Over all we achieved what we set out to do which was to test out the gear we have and what we can improve on and have an enjoyable night. Thanks to all the stations that made contact with us.